Here’s a gadget that everyone with a phone and a vehicle could benefit from. The DuoLinq 2-in-1 Car Charger will give you some extra charge for your devices while traveling. What do you get with DuoLinq 2-in-1 car charger? In the package, you will find a power port plug to stick in the cigarette lighter or 12V power port. Attached is a 3.3 ft long cable with a micro USB end. If you have an iPhone or other Apple product, however, there’s a Lightning charging end that pops right on to the cord. That leaves out a lot of newer phones like my Google Pixel 3 with its USB-C charger. No need to worry, though. There’s an additional USB A charging port built in. 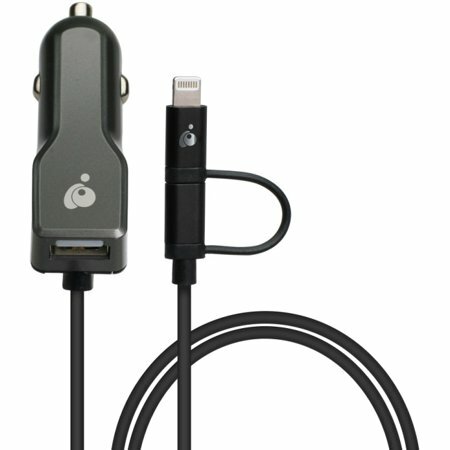 The 2.4 output will rapidly charge all Apple lightning equipped devices or Android devices with the micro USB charger. The connector that holds the cord is designed for strain relief, so you can be sure that it’s durable. This product has a retail price of $29.95, but I found this on WalMart.com for about $17. As of this writing, it is out of stock. $24.76 on Amazon.com. Here’s the usual disclaimer- we received this product for free in exchange for our fair and unbiased review. No other compensation has been given.